By Maha Jarmakani, D.O., Keri S. Conner, D.O. A 42-year-old woman with a past medical history of hypertension and poorly controlled type 2 diabetes presented to the emergency department with left flank pain, nausea and vomiting, subjective fevers, hematuria, and dysuria. She was initially treated at an outside facility with antibiotics without improvement. CT of the abdomen and pelvis was performed (Figures A-D), followed by appropriate image-guided intervention (Figure E). Patients with persistent flank pain and clinical signs and symptoms of infection despite appropriate conservative treatment need further imaging evaluation. Cross-sectional imaging, particularly CT and US when dealing with renal pathology, is instrumental in determining the underlying cause of the presenting signs and symptoms, evaluating for potential complications, and treatment planning for potential intervention. In a patient with an obstructed staghorn calculus, the primary considerations include xanthogranulomatous pyelonephritis, renal tuberculosis, and pyonephrosis. Patients with flank pain, constitutional symptoms, and urinary complaints that have failed conservative management or have worrisome clinical signs or symptoms, require further evaluation with imaging. CT and US are the mainstay for initial evaluation of renal pathology. CT in particular plays an important role in both evaluating the extent of disease and for interventional/operative planning. In the setting of staghorn renal calculi with obstruction, some unique clinical and imaging features discussed in this case review help distinguish between XGP, renal tuberculosis, and pyonephrosis. Imaging not only aids correct diagnosis, but it also helps determine the need for emergent intervention, potentially salvaging renal function. Leoni AF, Kinleiner P, Revol M, et al. Xanthogranulomatous pyelonephritis: review of 10 cases. Arch Esp Urol 2009;62(4):259-271. Craig WD, Wagner BJ, Travis MD. Pyelonephritis: radiologic-pathologic review. Radiographics 2008; 28(1):255-276. Yoshino T, Moriyama H. Case of the diffuse form of xanthogranulomatous pyelonephritis. Case Rep Urol 2013;936035. Rajesh A, Jakanani G, Mayer N, et al. 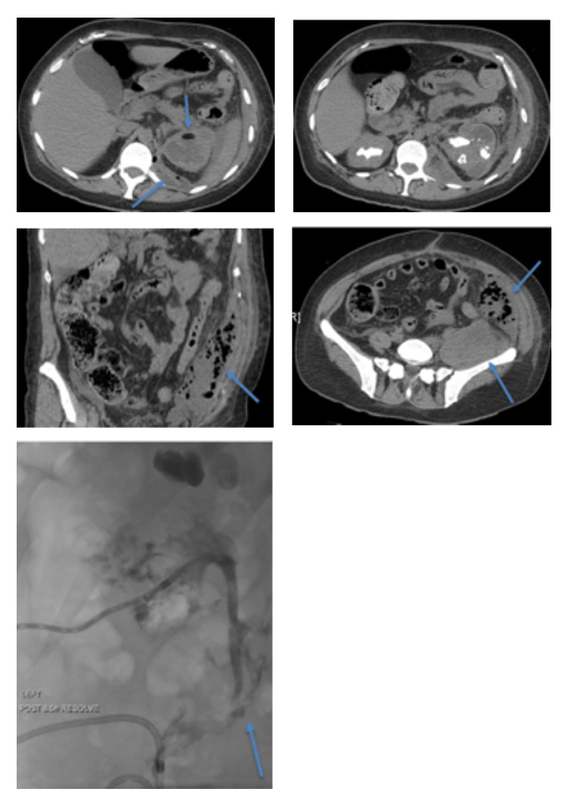 Computed tomography findings in xanthogranulomatous pyelonephritis. J Clin Imag Sci 2011;1:45. Gibson MS, Puckett ML, Shelly ME. Renal tuberculosis. Radiographics 2004;24(1):251-256. Yoder IC, Pfister RC, Lindfors KK, et al. Pyonephrosis: imaging and intervention. Am J Roentgenol 1983;141:735-740. Jarmakani M, Conner KS. Staghorn Renal Calculus, Obstruction, and Inflammatory Changes. J Am Osteopath Coll Radiol. 2018;7(2):16-18. Maha Jarmakani, D.O., Keri S. Conner, D.O. Dr. Jarmakani and Dr. Conner are with the Division of Vascular & Interventional Radiology, University of Oklahoma Health Sciences Center, Oklahoma City, OK.